Table 58 in the original print and web versions of this report incorrectly contained December 2007 data instead of December 2008 data. All the data in Table 58 has been corrected in the web version of this report. Table 25 in the original print and web versions of this report contained errors. All the data in Table 25 has been corrected in the web version of this report. Disability benefits were paid to over 8.5 million people. Awards to disabled workers (877,226) accounted for about 89 percent of awards to all disabled beneficiaries (987,525). In December, payments to disabled beneficiaries totaled more than $8.6 billion. Benefits were terminated for 563,314 disabled workers. Average age was over 52. Men represented nearly 53 percent. Average monthly benefit received was $1,063.10. Kevin Kulzer managed the preparation of the data in this report. Hazel Jenkins, Art Kahn, Kia Masseaux, Sheron Matthews, and Clark Pickett wrote the programs to process the data and produce the statistical tables. Glenda Carter wrote data specifications. Glenda Carter, Hazel Jenkins, and Kia Masseaux validated the data. Staff of the Division of Information Resources edited the report and prepared the print and electronic versions for publication. Your suggestions and comments on this report are welcome and should be directed to Kevin Kulzer at 410-965-5366 or di.asr@ssa.gov. For specific questions about the data, please call or e-mail the contact listed on each table. The tables on noninstitutionalized beneficiaries based on the Survey of Income and Program Participation (SIPP) have been removed from the Annual Statistical Report on the Social Security Disability Insurance Program. Because of increased attrition of survey participants over time and increasingly low match rates to administrative data, attempts were made to improve the reliability of estimates based on the SIPP. 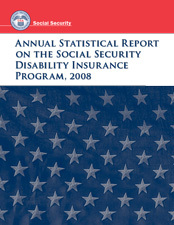 The Office of Research, Evaluation, and Statistics (ORES) contracted with the Census Bureau to conduct a special SIPP-based interview of Disability Insurance and Supplemental Security Income beneficiaries. Estimates based on the additional data were not available when this report was published. However, ORES anticipates publishing these estimates in another publication as well as highlighting the changes in the data and the reliability of the estimates. This decision reinforces the inherent differences between the survey data used to produce the estimates of noninstitutionalized beneficiaries and the administrative data used in this publication.